Universal is recognized as one of the leading manufacturers and exporters of starch and glucose plant, their equipment, machineries which is to produce starch, glucose and it's by products. Our product assortment is manufactured at our high end fabrication unit using premium quality parts and components. 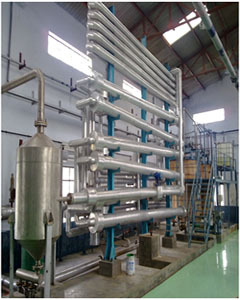 One of the highlighted aspects of starch and glucose plant is that starch is produced according to the requirement of the end user depending upon changing reaction condition and strict process control methods. To facilitate the aspects of customized or specially developed starch also called the modified starch, we develop and design starch processing equipments and glucose plants that meet varied requirements in starch and its derivative manufacturing unit. As starch and glucose plant produces a pure and renewable nature polymer, they cater to multiple usages in ceramics, textile chemicals, printing industry, bioplastics, body powder, oil exploration, etc,. Our advance fabrication facilities, team of industry professional and technical knowhow enable us to meet client's specific requirement by developing custom design starch and glucose plant. These starch and glucose plants are appreciated for their compact design, high durability, easy to operate, low maintenance and high efficiency and available at market leading prices.